Basalts forming the floor of the Indian Ocean are geochemically distinct from those of the Atlantic and Pacific Oceans. These differences have been attributed to a deeply recycled continental component or to widespread dispersion of plume-type mantle within the Indian Ocean asthenosphere. 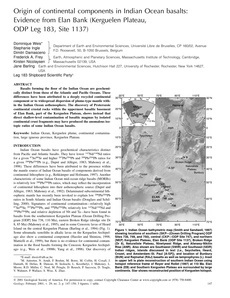 The discovery of Proterozoic continental crustal rocks within the uppermost basaltic basement of Elan Bank, part of the Kerguelen Plateau, shows instead that direct shallow-level contamination of basaltic magmas by isolated continental crust fragments may have produced the anomalous isotopic ratios of some Indian Ocean basalts.